Seven young children, all believed to be from the same family, have died in an early morning house fire in the Canadian city of Halifax, police say. 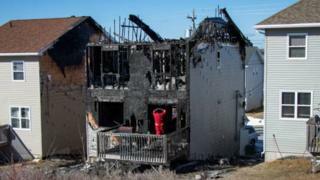 A man and a woman were also injured in the fire that broke out around 01:00 local time (05:00 GMT) on Tuesday. Fire crews encountered a blaze that had quickly engulfed the first and second floors of the building. Police did not identify the victims but CBC News has reported that a Syrian family lived in the destroyed home. The family had been in Canada for almost a year-and-a-half and had arrived in Halifax about six months ago, Imam Abdallah Yousri told the BBC. He said the family attended the Ummah Mosque, where the funeral will be held. Mr Yoursi said the youngest child killed in the fire was just four months old and the oldest was 15. A Halifax refugee resettlement organisation who sponsored them identified them as the Barho family in a Facebook post. The father's injuries have been described as "life-threatening" and he was in a critical condition. Authorities say it took about an hour to get the flames under control when fire and emergency services arrived on the scene. They had been receiving multiple calls of a fire in the residence in Spryfield, Halifax, in the Canadian province of Nova Scotia. The two-storey home appeared completely gutted by the fire. Halifax authorities confirmed that an investigation into the house fire is under way and said it is too early to speculate on its cause. Canadian Prime Minister Justin Trudeau was among those who offered his condolences. "Words fail when children are taken from us too soon, especially in circumstances like this," he said on Twitter. Halifax Mayor Mike Savage also offered words of condolence, saying the community "is heartbroken and our thoughts are with the loved ones of the family". A fundraising campaign has been set up to assist the surviving family members.